Our roof repair services are available to both commercial and residential customers in Innisfil. When you turn on your TV to one of the many home and garden channels, you may notice an increase in the number of people trying to handle home renovations and repairs themselves. While some tasks are fine to attempt on your own, there are many that should always be left to professionals. Roof repair falls into the latter category, since repairing your own roof can lead to a variety of problems. Climbing up onto your roof is dangerous and could cause serious injury if you fall. You could also cause more damage to your roof that will be expensive to fix. It’s hard to know for sure if your home or office is in need of roof repair. Since you probably don’t spend a lot of time up there, you may not be able to see if the shingles are cracked or missing. One way to know is if you notice any holes or patches of light coming through the ceiling in the attic or highest space in the home. You can also contact our team at Slippery Slope Roofing to schedule a consultation with one of our roofers, who can perform an inspection of your roof to look for damage. Our roof repair services are available to both commercial and residential customers in Innisfil, Ontario. We can handle roofing jobs of all shapes and sizes, and we only work on one roof at a time. 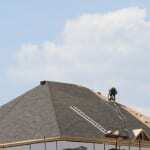 All of our roofers take care to keep the job site clean and handle tasks in a timely manner. Contact us today to learn more!